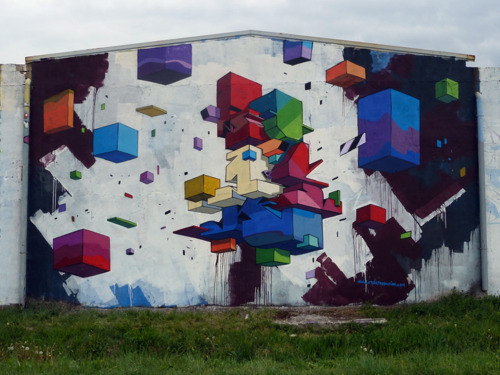 Italy’s Etnik has developed a geometric style with real depth and perspective. His 3D cities appear to float off of the walls they’re painted on – he’s created his own World and brought it to life wherever he’s painted. I’m half Italian and half Swedish but I’ve lived in Vinci all my life, close to Florence (Italy). I still live in Tuscany and my studio’s in Florence (www.bunker108.com). I’ve been drawing all my life bit I started painting graffiti some 20 years ago. 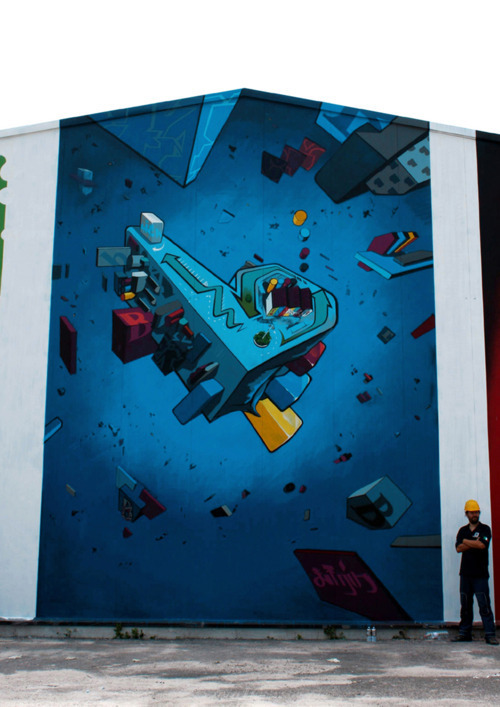 I’ve always worked as hard as I can; I looked towards the more innovative graffiti scenes across Europe and America. The Italian scene is not so innovative. As a graffiti writer I always love to paint style of letters but I always painted more than the simple letter pieces. I always organize the concept and backgrounds for the many people I’ve painted with - that has helped me to evolve a lot. I started painting the “Prospective Cities” 10 years ago – that’s the name that I give to the subjects in my painting; they’re all prospective, architectural illustrations! 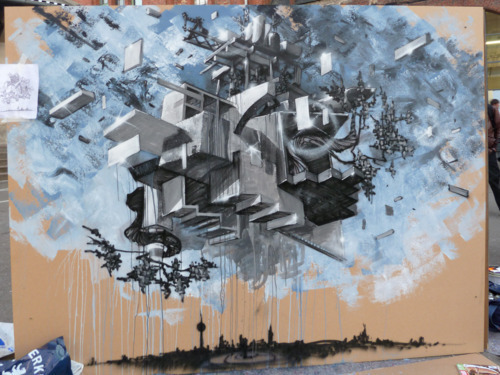 It’s my particular style to put lettering, architecture and illustration in one painting. As a graffiti writer I still paint my letters inside my paintings. I put the letters into a space and then go on to paint different things as a theme (e.g. nature , characters, etc.). I use my letters to represent a point of view about any argument and to represent the precarious stability of humans. The result is a big fantastic illustration. I also work on canvases and sculptures for installations. I’ve been involved in many exhibitions in Italy and across Europe like the Kosmo Tour, Stroke ArtFair and Carhartt-Gallery. 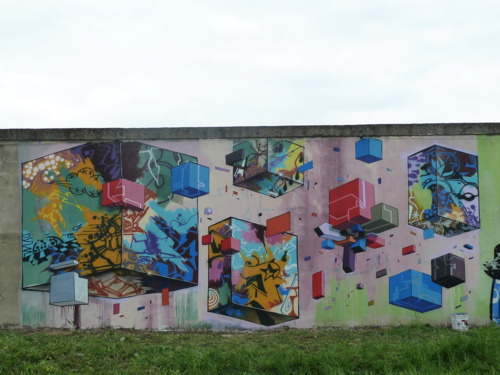 I love to collaborate with other artists so I often paint with Macs, Sera and Duke1 (Macs is an Italian writer who I’ve traveled with a lot over the past few years; Duke1 and Sera have been members of my crew - KNM crew – for the past 18 years)! 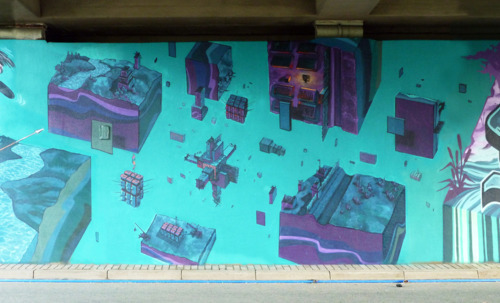 I’ve also painted with artists like Blu, Loomit, Zedz, Daim, Satone, MacCrew, CanTwo and more!